← What about the mountains? Some readers may not be aware of this, but Italy is just round the corner from the French Riviera… In fact, if you are in Menton, you can easily walk across the border! The Italian town of Ventimiglia (Vintimille in French) is located at the terminus of the coastal railway line that runs between Nice and Monaco, so you can easily have an “I’ve set foot in Italy” moment during your visit on the Riviera and add it to your countries’ list if you’ve never been to places like Rome, Florence or Venice. Yes, the train that I hopped on in Monaco was actually jam-packed with elderly French people with shopping carts so I figured there must be some amazing deals at the Friday market. After a short 25-minute train ride along some stunning coastline (keep your eyes for some great panoramas of Monaco between Roquebrune-Cap Martin and Carnolès stations, as well as some amazing coastline and surfing beaches between Menton-Garavan and Ventimiglia itself), I got off in the rather grotty Mussolinian-style train station and followed the crowds through the rather picturesque “new town” towards the covered market. This part, with typical local fruits, vegetables and fish and open virtually all week, not just on Fridays, is actually very pleasant and well worth the visit. 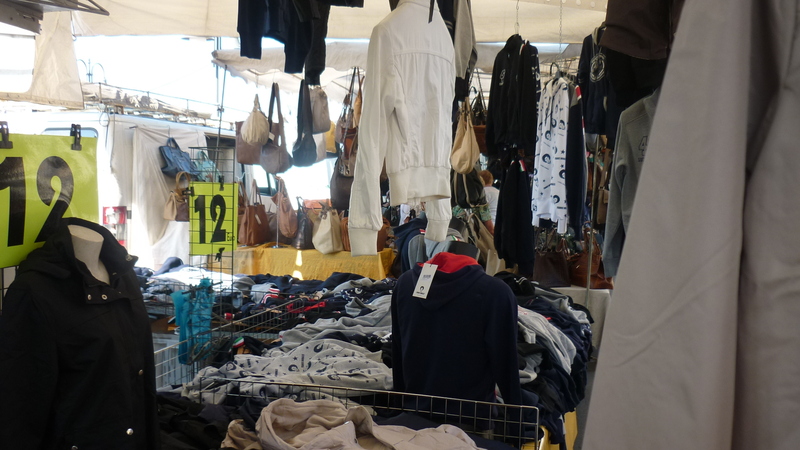 The prices are generally lower and the quality higher than what you will find across the French border, with plenty of typical Italian produce such as dried tomatoes, olive oil and balsamic vinegar. 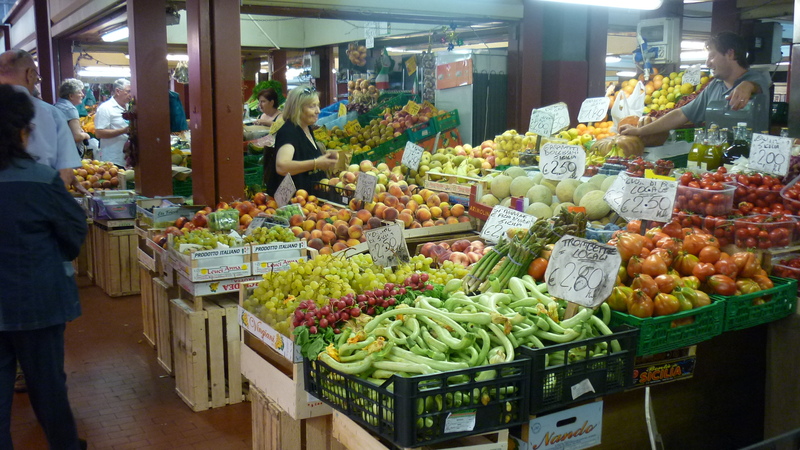 The very Mediterranean fruit and vegetable section in Ventimiglia market, this is the kind of thing you would expect to find in Italy! However, the typical Friday section left plenty to be desired: plenty of stalls of rather unoriginal and not so cheap (ie. more or less the same price as in the high street) handbags, shoes and clothes: I’ll leave you to judge from the photos below. So the watchword for this part is: don’t bother braving the Ventimiglia crowds on a Friday, it really isn’t worth it. 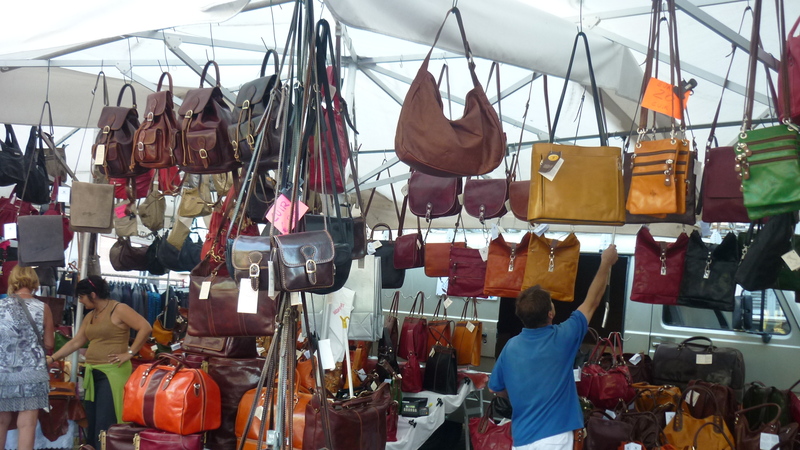 And here’s the handbags section… Not really worth braving the crowds on a Friday to see this. Despite this, the rest of Ventimiglia is definitely worth a look around. The place might seem pretty shabby and run-down when you arrive and certainly not as pristine as the French side of the border, especially Menton, but has its hidden charms, which you don’t have to wait until Friday to discover, unless you want to share the town with “bargain” hunting tourists who will get ripped off. Get away from the bustling shopping streets full of cheap and tacky alcohol shops surrounding the train station (yes, certain spirits like pastis are much cheaper in Italy than in France) and head towards the Roya river that separates the modern part of town (where the train station is) and the older medieval section, known as “Piazza”, on top of the hill. On the way, you can see some typical Mussolinian/fascist ie. rather ugly architecture in the town hall that dominates the square near the market and the river. You can first follow the river down towards the beach which is extremely pebbly but affords lovely views of the coastline westwards in the direction of France, and where you can see Monaco and Cap Ferrat on a clear day. The beach area is nothing too special, just a long strip of beach restaurants which are quite dead anytime other than summer evenings. Then head back across the Roya with the pedestrian footbridge: the area is very pleasant, with fishermen, plenty of waterfowl (ducks, swans and coots) and very large trout swimming in the shallow and crystal clear river water. Walk up the slope to the heart of the medieval old town: to be honest, Ventimiglia’s “Piazza” is quite picturesque with plenty of small alleyways, old stone houses, ancient shops and a little square but there are plenty of much more charming and original old Italian villages nearby, especially in the Nervia valley, a bit further inland. But if you only have a day in Italy, you may as well check it out. There are also a couple of churches worth a photo and some nice views over the Roya Valley and the coastline, even though some parts of the area, heading northwards, are nastily industrial and bisected by the Nice-Genoa motorway. The main square of the Old Town of Ventimiglia – rather quaint but you can find nicer old towns elsewhere in the region. 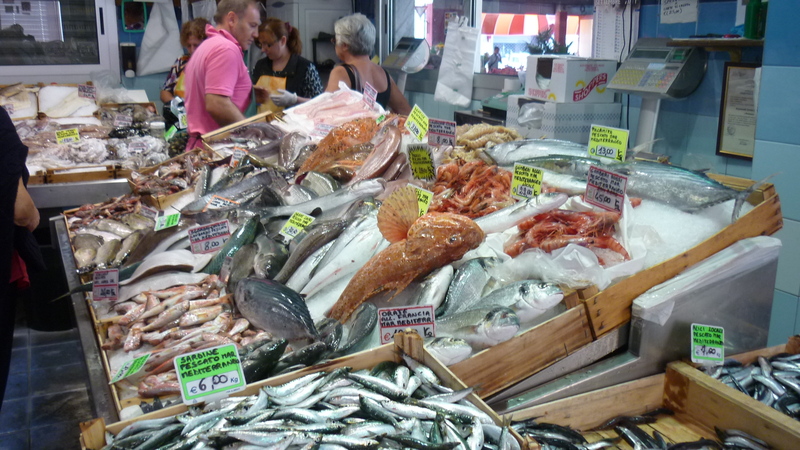 One good thing about visiting Italy is always the food: generally prices tend to be similar to those found in France, especially in upmarket places, but the quality is normally much higher, so better value for money. In the bustling shopping streets of the “new town” surrounding the train station, you can find plenty of cheap and good quality bakeries and cake shops to get a nice snack, as well as some good Italian coffee and ice cream. The best places to eat can be found in the area across the Roya river, just below the old town, with a few cheap pizzerias and plenty of seafood and fish speciality restaurants – for those of you who like fish, you should try some Ligurian specialities such as fritto misto (fried anchovies and sardines) – in Italy you tend to get real fish as opposed to the frozen calamari rings and plastic “gambas” that you will find on the menu of some tourist traps in France. For pasta lovers, Pasta e Basta (see Tripadvisor page) is the place to go, just around the tip of the old town, facing the sea. The homemade pasta is absolutely out of this world, though far from cheap by Italian standards (anything between 10 € and 16 € depending on how refined your combination of sauce and pasta is). But honestly, I think it is worth it, given the size and quality of the portions. The place is very popular with people travelling across the border from France and Monaco for a nice meal, so make sure you book in advance, especially on weekends. By train: the easiest option is by far the train, as Ventimiglia is the terminus of the coastal line that runs from St Raphael, via Nice and Monaco. Allow about 25 minutes from Monaco (3.50€ single trip ) and 50 minutes from Nice (7 € single) – this option is the smoothest and the most comfortable but, as I mentioned earlier, try to avoid Fridays if you don’t want your ankles knocked in by shopping cart wielding old ladies looking for a pseudo-bargain at the market. Timetables on the French train website. By bus: it is possible to get there by public bus, but a real hassle so only do it if you want to save some money but have a huge amount of time to spare, or else if you have an inexplicable phobia of taking the train… Take the line 100 bus from Nice or Monaco to its terminus in Menton (1 €, a bus every 15 minutes on average), then switch over to the 905 bus in the direction of Tende – it’s a 15 minute, 1 € ride to Ventimiglia but the buses on this line are very few and far between (see timetables here) so I would just take the train. By car: nice and quick by the A8 motorway east from Nice (45 minutes) or Monaco (30 minutes) but you need to find somewhere to park once you get into town, try the railway station for minimal hassle. Don’t even try to venture anywhere near Ventimiglia by car on a Friday (this includes if you’re heading to any of the inland valleys) as the traffic across the town is a nightmare and you’ll immediately regret it. But if you follow my advice, you won’t be visiting on a Friday, so it won’t matter! So in conclusion, if you only have a day to check out Italy and are using the train, Ventimiglia is just about worth the visit: the atmosphere is relatively pleasant and you definitely feel, coming from France, that you’re in a different country, which is your main reason for going there. Just don’t bother waiting for the Friday market, believe me, it really isn’t worth the hassle – on the contrary, try to avoid that day if you can. And bear in mind that if you have a bit more time, there are much nicer places to visit nearby in the hinterlands behind Ventimiglia or a bit further down the coast, as long as you have a car. This entry was posted in The Italian side of the border. Bookmark the permalink. Great post thinking of going there when im in Cannes in a few months. This has been very helpful as we are in Ventimiglia now. We will post later of what we find. Getting this information from the official websites of the train system is like pulling teeth from chickens (which have no teeth). You have given me EXACTLY what I needed to know about travel from Ventimiglia to Nice. THANK YOU! Just wanted to add I enjoyed your blog BUT, contrary to your opininion . I love the Friday market !! I have been there many times and I always find a deal…I guess if you are a shopper, and have time to search there are always treasures to be located ! But your other info was right on point and well written. Great post and great website! Can’t wait to explore Liguria on my next trip to the coast. Kevin, Thanks for the great info. on Ventimiglia. I’m coming from Paris to Nice with a girl friend who has never been to France & Italy. We’re arriving at 1:30pm, Friday Oct 25th… hope to catch some of Old Nice & see the French Riviera, then head back to train station to Monaco to show her Monte Carlo. I think sunset is around 6:30pm. We’ll probably leave Monte Carlo around 6:30pm to Ventimiglia. Hope to overnight there instead of Nice so we can catch the 6:30am train to Florence. Do you think this is a reasonable schedule? 1. Depending on where you arrive in Nice, head straight into the old town (bus 98 from the airport or tram line from the train station), then have a socca on Cours Saleya and soak in the atmoshpere until about 3.30pm – make sure you catch the view from the Bellanda Tower and walk a bit around the Promenade des Anglais just below. 2. Take the bus, line 100, from close to the Old Town direct to Monaco. It’s a bit longer than the train (about 45 minutes) but will afford much nicer views of the beautiful Riviera coastline east of Nice (including Villefranche, Beaulieu and Eze). 3. When you get to Monaco at around 4.30pm, get off at the Place d’Armes then head up the ramp to the Palace Square to enjoy the lovely view. 4. Follow my walking tour of the Old Town (though you won’t have the time to see the Palace or the Oceanographic Museum) then walk down to the harbour. 5. If you still have time, I would definitely advise to see the casino at dusk and the gardens behind it overlooking the sea to get a glimpse of the Chic of Monaco. 6. Take a train to Ventimiglia at around 6.30/7pm (it’s only 30 minutes, the station is 15 minutes walk from the casino). It will already be dark by then but that way you’ll miss the rush hour commuter traffic leaving Monaco and you’ll have optimised your visit in the Principality. 7. Find a hotel close to the train station in Ventimiglia for your early start, there are plenty of good options on Tripadvisor, and grab a nice Ligurian meal (pasta with pesto and then fritto misto are the regional specialities and very different from what you will find in Tuscany) in the centre of Ventimiglia! Hey Kev, my mate reckons the trout you mention are mullet ? What do you say, do you know yOur fish ? They are indeed mullet. I only ever spotted (pun intended) one trout off the bridge, and I spend several weeks each year in the locality. There are lots of trout further upstream, but very seldom are they anything like the size of those mullet, which are typically between 1 & 2 Kg in weight. The trout upstream are more likely to weigh less than 500g (and unlike mullet they do not form shoals: trout are a more solitary species). Love your Blog though Kevin, I must say! Great post Kevin. I will have a week in Menton in September. I was thinking of exploring a bit of the neighboring Italian Riviera. Thinking of Ventimiglia, but would not mind skipping it for something a little more exciting. San Remo? Is it too far for a day trip? No it isn’t: if you’re going by train, you’ll need to change in Ventimiglia though so you can combine both. 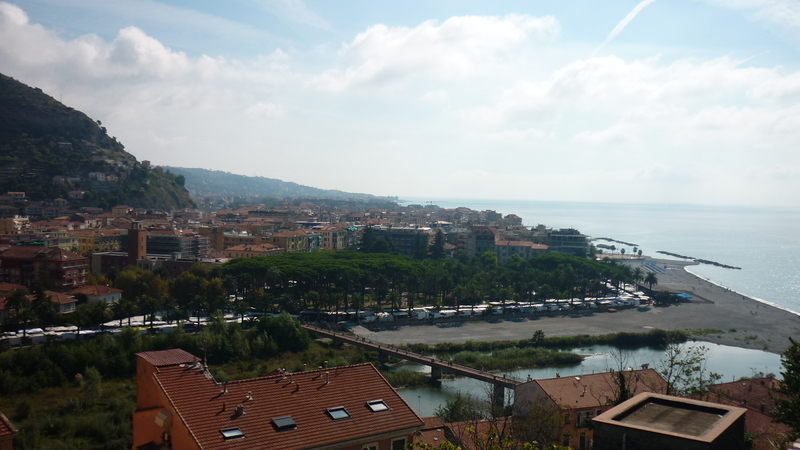 Here are some ideas about what to do in San Remo: https://french-riviera-blog.com/2012/02/05/the-italian-coastline-cycling-from-san-remo-to-imperia/ You can also check out my article about the Nervia Valley which is lovely but for which you will need a car. Going here in a few months. Very informative. Thanks! Hi Kevin – very useful. Came upon your blog by chance & hope to do San Remo/San Lorenzo cycle route tomorrow. Wonder if u can help with something that I have failed to progress in the area. Hiking trails on French side of border are very well documented & marked but I have had no joy with getting decent info on coastal & hinterland walks in Western Liguria. I know there is a long distance route the Alta Via that starts in Ventimiglia but I have not been able to find any info in English on it or any other routes that might take in Dolce Aqua, Pigna etc that I would love to walk rather than drive. Any thoughts? Thanks for the positive feedback on my blog. Hope this helps ad enjoy your bike ride today, feel free to give me feedback about that! Hi Kevin – thanks for the walk info. Back in UK now but will investigate when we are back in Nice at the end of the month. We did the cycling covering Ospedaletti – San Remo – San Lorenzo which was very enjoyable. Unfortunately got to San Lorenzo too late for lunch at Bar Emy. Thanks for your help. I have heard that there is a picturesque train from Monaco or Menton to nearby Italian towns on the Italian Coast. Yes that’s right, this is simply the express regional train running between Nice and Ventimiglia via Monaco and Menton. If you want to carry on farther down the coast, in most cases you will need to change trains in Ventimiglia. The train line is extremely picturesque all the way down the Ligurian coast up until La Spezia, but be earned that it is also very slow… More info and timetables on http://www.trenitalia.it. Hi Kevin. We’ve been in Ventimiglia today (23rd January) and had a lovely morning in the market followed by an excellent lunch at Pasta e Basta – a great recommendation. We think you are definitely underselling the market ! We’re old hands at tacky markets both in France and around the world in Singapore, Thailand, Hong Kong and China, and this one actually ranks pretty highly – quite like Stanley Market in Hong Kong. 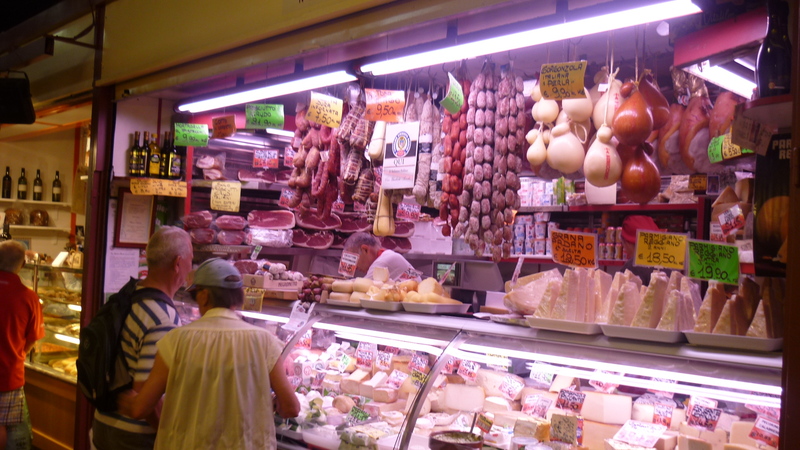 Yes there is tourist rubbish, but there are also decent quality Italian leather things (not the usual tacky knock offs of international brands) and some really lovely cheese, fresh pesto and meats. We enjoyed our morning and had a coffee on the way to keep the energy levels up. We went for an early lunch at Pasta e Basta, (which folk might like to know is fairly far along the seafront across the bridge from the market, and right along as far as the abandoned marina project) and had two huge plates of fresh pasta with mountains of parmigiana , a glass of wine, a beer and a coffee (plus the inevitable complimentary Limoncello !) for €35-ish. They also speak fluent French and English. It was excellent. Thanks again for the guide, which gave us the idea in the first place ! We travelled by car from Mougins near Cannes at morning rush hour with the usual motorway jams, and it took us about an hour and ten minutes. Dear IHK, yes, if you are leaving from Ventimiglia, there are regular trains to Genoa that stop in most resorts on the coast and therefore are pretty slow (but at least the sea views are pretty). If you wish to travel further south down the coast from Genoa (ex. Cinqueterre or the Portofino area), you’ll need to change in Genoa in most cases, though there are sometimes direct trains. If you are travelling from Menton, you’ll need to change in Ventimiglia. Full train schedules on http://www.trenitalia.it . Hope this helps! My husband and I are going to Nice next week for Valentines weekend. Can you recommend a nice Italian village/town near to Ventimiglia that we could go to for the day on the Friday or Saturday to have a taste of Italy. We don’t mind going to Ventimiglia fromo what you’ve said but if there is something quite near that is a bit more special/picturesque then any recommendations would be much appreciated. I guess we would probably catch the express train you talked about direct from Nice over the border. Wouldn’t want much more than an hour or so travelling. Also what time are the latest trains back to Nice from Ventimiglia? 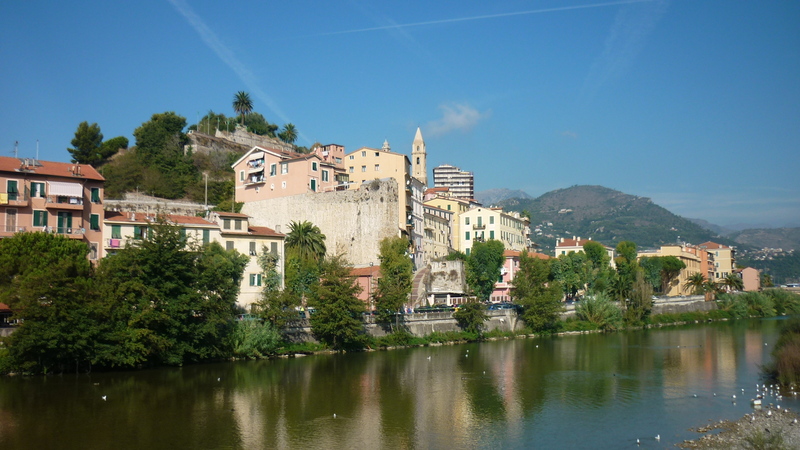 1/ The most beautiful villages close to Ventimiglia are in the Nervia valley, such as Dolceacqua and Apricale, which are detailed in this article: https://french-riviera-blog.com/2012/04/14/the-italian-hinterlands-dolceacqua-and-the-villages-of-the-nervia-valley/ . The only downside is that there are no trains there, you will either need to take a rental car (which will give you more flexibility if that’s an option). Alternatively you can take a bus from Ventimiglia to Dolceacqua which is pretty romantic and will give you a nice taste of Italy, timetables are here: http://www.dolceacqua.it/turismo/images/stories/immagini-fisse/OrarioRT.png but it will be a bit more than an hour to get there from Nice (allow around 25 minutes from Ventimiglia to Dolceacqua by bus). In general, for a romantic time and a taste of Italy, I can really recommend the Nervia valley, so if car rental is an, option, go for it, you won’t regret it – it will give you much more flexibility to explore the whole valley and not just one village, besides Italian driving isn’t as bad as people make it out to be! 2/ An alternative and perhaps slightly more accessible option by train is the town of Bordighera which is 2 stops down the coastline from Ventimiglia: it’s got a pretty pleasant waterfront with nice views over the coastline towards Monaco, although it lacks the medieval charm of the inland villages. To get there, you need to change trains in Ventimiglia, from Ventilmiglia to Bordighera it’s only about 10 minutes and trains are pretty frequent: it’s generally cheaper if you are coming from Nice to buy a train to Ventimiglia on the French system and then get an Italian ticket to Bordighera, it’s pretty complicated to get a “through” ticket. 3/ Finally, if the two options above are too complicated for you, just stick to Ventimiglia, the old town and the waterfront area have some charm, although options 1 and 2 will give you a better impression of Italy. Finally, you can find the latest train timetables on this link: http://cdn.ter.sncf.com/medias/PDF/paca/FH_04_Mandeleiu_Grasse_Cannes_Vintimille_7janv2015_tcm65-37903_tcm65-18369.pdf . The last train from Ventimiglia back to Nice is early, at 8.52pm so plan accordingly – there are currently major engineering works (just like Sundays in the UK!) on the train line near Monaco, which is why transport is a bit messed up east of Monaco. Trains before that leave at 6.52pm and 8.15pm. This is another reason why the rental car option should definitely be considered if you can, you won’t need to fret about getting back. Hi everyone, When booking my trip to the cote d’azur I could not resist hopping into Italy since It’s so close and Italy is literally my favorite country in the world thus far. So I booked 4 nights in Ventimiglia. I don’t want to go all the way down to Cinque Terre as I was there 2 years ago. What other towns do you suggests I visit in the area i’m willing to travel up to 1h30 either north or east. And Is Genoa worth it? 3/ If you have some spare time, follow the coast east for around an hour and explore by train or car the seaside resorts of Albenga, Alassio and Finale Ligure (the latter is lovely and has a lovely medieval village tucked inland called Finalborgo). 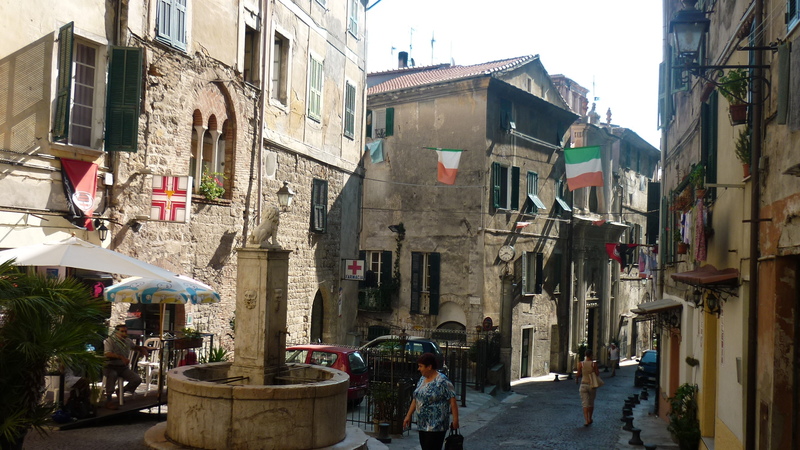 4/ Do not neglect Genoa if you have time, it’s beautiful and worth seeing! Hi, thanks so much for this. I had planned to try and hit Ventimiglia on a Friday based on Lonely Planet but now with this in hand I’ll let it fall on whatever day is convenient.